Where's the Fire Marshall When You Need Him? 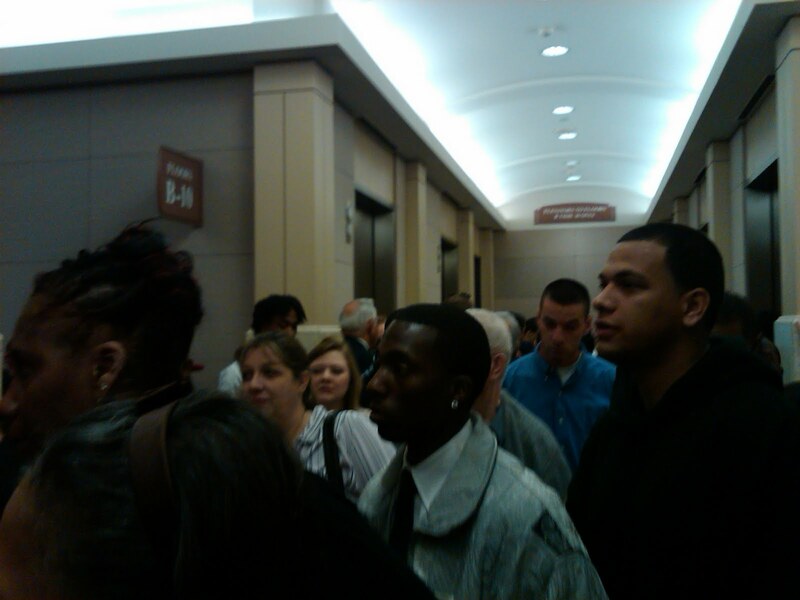 One of the common gripes from all morning attendees at the Harris County Criminal Justice Center is the absolutely ludicrous crowding that occurs every day at the elevator bank. The morons who designed the CJC have two sets of elevators. On the west side of the building, there are four elevators that run all the way up to the 10th floor. A fifth elevator runs from the basement all the way to 20, but good luck catching it. Half the time, it has been commandeered by bailiffs trying to get a jury panel up to a courtroom. On the east side of the building, there are six elevators that will take you from the first floor up to the 10th floor through the 20th floor. On any given weekday, one of these elevators will be out of commission, as more and more people jam their way past the metal detectors in the lobby into the elevator bank. There are no escalators and there is no public access to stairways. All rules of civility are thrown out the window as it quickly becomes every man and woman for themselves. Elbows are thrown and insults are hurled. Tensions flare in an already tense building, and the whole damn situation created every morning just isn't a safe one. I took this picture this morning just to give you some idea of what it looks like, but it doesn't really even begin to do the chaos justice. Trust me, when you are longing for the spacious and roomy atmosphere of a New York subway, you are really in cramped quarters. Oh, and don't forget that when you actually do get on an elevator, you get to deal with these folks. A couple of years ago, the Fire Marshall came out and inspected the courtrooms and hallways and declared there could be no furniture in the seldom-used hallways behind the courtrooms. Apparently, furniture created a fire hazard. Keep in mind, these areas that they addressed aren't accessible to the general public and are never congested. But, the good folks with the Fire Marshall decided any type of furniture in the hallway, like, say, a chair, could be a threat to human life in the event of a fire. But somehow they manage to overlook the elevator situation that happens every day?! I'm really not trying to stir up trouble here (this time), but something really needs to be done about this situation. A commentor on my last post asked me when I was going to comment about the impending layoffs that the District Attorney's Office is going to go through in light of county-wide budget cuts (as detailed in yesterday's Chronicle). The bottom line is that I don't know that much about what's happening any more than the rest of you guys. The budget cuts are across the county board, so I don't think that we can directly place the blame on Lykos and the Gang for the necessity of doing the layoffs. But, I do think it is probably safe to assume that none of the people that Lykos brought with her when she took over will be on the chopping block. Although I'm sure the funding for things like the hardwood floors in her office and Hannah Chow's water coolers were all funded from asset forfeiture and not from the county budget, it still becomes a bitter pill to swallow when good, hard-working employees are being terminated. I think it would be really interesting to examine how Lykos is spending the money that she does actually have in the budget. She's running off good investigators right and left over there (so that about the only one's left are Nick Lykos' fishing buddies), but they aren't replacing them. Where is that money going, exactly? I'll keep you up-to-date as the information becomes available right now, but my guess is that there will be no rhyme nor reason to who Lykos keeps and who she lets go. Unless, of course, you are one of her buddies, and then you'll be safe. 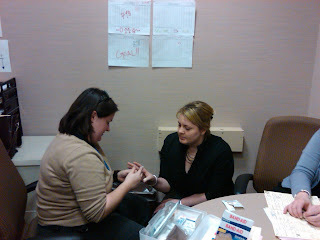 With all of the county-wide budget cuts going on lately, it was not surprising to see Assistant District Attorney Lauren Bard doubling up on duties and having to play medic today in the 178th when fellow ADA Lauren Byrne managed to injure herself on a file. I was impressed to see that the D.A. 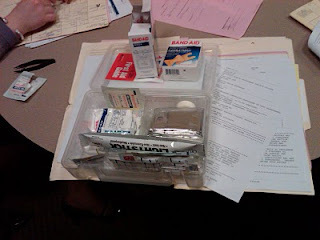 's Office has a quite impressive First Aid kit at their disposal. I'm not real sure what the lightstick is for, unless they are anticipating a possible Ecstacy overdose. But, anyway, Lauren did a good job doctoring up, um, Lauren. Hopefully Byrne will be able to successfully navigate those dangerous manilla folders in the future. I was amused/irritated this morning to go read the comments on Big Jolly's blog post regarding the 180th election. Looks like one of Danny Dexter's people has decided to take the insanely juvenile approach of posting negative comments about Marc Brown and positive comments about Danny under the name of "Murray". On the one hand, I'm flattered that somebody would want to assume the name of a pasty bald guy who has a name reminiscent of the fat kid in the schoolyard who eats paste. On the other hand, however, you have to take a step back and realize that this childish little tactic is being used by a candidate's supporters when that candidate is running for a JUDICIAL BENCH. This race isn't for High School Student Council, folks. It's for a position where the winner will ultimately be presiding over matters of Life and Death. Danny and his people need to grow up. The truth, the truth is calling . . .
Looks like 180th District Court candidate (and failed prosecutor), Danny Dexter decided that he could find an ear to listen to his story over at www.bigjolly.com, as he addressed what he believed to be unfair criticism over his job performance on this blog and in the minds of all those who suffer from common sense. In his lengthy response to Big Jolly, he denied that he had been fired from the Office for incompetence, pointing out that he had resigned. But then Marc Brown had to haul off and point out the truth by forwarding Big Jolly the memo from then-First Assistant Bert Graham detailing the meeting he had with Danny when he politely gave Danny the option of resigning or being fired -- for incompetence. What are we going to do with you? I mean, it's one thing to have no clue what you're doing, but to start blatantly misrepresenting facts is getting dangerously close to getting the old "Liar" label. In congratulating Paula Goodhart on her appointment to the bench in County Court at Law # 1 the other day, I failed to also congratulate Natalie Flemming on being appointed to the bench in County Court at Law # 3. (NOTE: I have a good excuse. I'm on Paula's e-mail list, and I'm not on Natalie's, so I literally didn't get the memo). Anyway, congratulations to both new Judges. I'm sure we are all looking forward to working with you in the future. Congratulations to Paula Goodhart, who was informed yesterday that she will be sworn in on March 23rd as the Judge of County Court at Law # 1 of Harris County -- replacing retiring Judge Reagan Helm. There will be a Swearing In ceremony at 2:00 p.m. in Court # 1 of the CJC. Out of all the criminal justice races that we had in the primaries, the only one going to the run off is for the Republican candidate for the 180th District Court featuring Felony Division Chief Marc Brown versus terminated-for-incompetence-many-years-ago Danny Dexter. This is an important race because the winner will be facing off against the Democratic Candidate Darrell Jordan who has some severe issues of his own (not the least of which is inexperience). Marc Brown has recently gotten the endorsement of legendary former District Attorney Johnny Holmes (who rarely comes out of retirement to endorse ANYONE), and I'm hoping that this will motivate you, and your Precinct Chairs to get the word out that Marc Brown is far and away the best candidate in the race. Not to mention that his former opponent in the race, Emily Munoz, has also endorsed Marc for the job. Marc has a fundraiser tonight at Diego's (formerly Picazo's) in Downtown from 5:30 - 7:30. I hope you can make it and lend your support for the unquestionably most qualified candidate in the race. More importantly, don't forget to vote for Marc once the run-off early voting begins. I'm back from trial Brazos County, where Dan Cogdell was kind enough to let me sit second chair with him on this case. It was an honor to represent Ron Johnson in this case, and it was incredible to get to meet the men who serve in the United States Marines. I can't begin to describe what an incredible group of young people our country has defending the rest of us. On a personal note, I was also very honored that Dan asked me to sit with him and David "K.F.P." Brown on this case. Although I was always familiar with Dan's excellent reputation as a defense attorney, I never had a case against him. He (and Brown) were just stellar to watch. Guys, I was very honored to be part of the Garage Band, and I couldn't be more proud of the results. The run-off system is not always the best qualified candidate's friend. Exhibit A, of course, is none other than Pat Lykos. Out of the Criminal Judical Races, only one of them is headed for a run-off, and thank goodness it is. Marc Brown and Danny Dexter will face off on April 13th (with early voting the week prior) for the Republican Nomination for the 180th District Court. In case you missed my original recap of the race, you can find it here. Folks, Danny Dexter has got no business being in a position where he would literally preside over life and death situations in a Capital Murder trial. He is one of a very small amount of prosecutors that was ever fired for incompetency while I was at the Office. Marc Brown, on the other hand, has the knowledge, skill, and temperment to be an excellent judge. Sadly, Danny has had the support of some Republican bigwigs that know nothing of the Criminal Justice System, and it is that kind of support that thrives in the runoff system. It's that kind of support that got Pat Lykos elected. And it's that kind of support that we've got to be fighting against now. There aren't going to be that many races with runoffs, so mobilize now. Marc has a Facebook website up now. You can become a fan by going to it here. Emily Munoz (who was previously in the race) has already given her support to Marc, and hopefully those who voted for her in the election will vote for him. You just have to remember to vote during the Run Off. Join the Facebook website and mark your calendars to vote in April. Tell your friends and family. Don't let another Lykos scenario happen, guys. I Can't Leave You Kids Alone for A Minute . . .
Good Lord, I go out of town for a week, and you guys let the damn Death Penalty get abolished? Only in the 177th until the ruling gets reversed. Man, the Democratic Judicial candidates right now are going to be pissed . . . I know election results are coming in but . . .
. . . I find this story to be much more interesting. Somehow, somewhere, I'm betting Bill Exley is involved in this some way. Election Day (and I'm Out of Town)! Tomorrow (Tuesday) is Election Day and if you never quite found the energy to go early vote, you need to get off your keister and go figure out where your polling place is. I know it may seem like we all enjoy griping about some of the elected officials we have now, but I think we lose our ground to complain if we don't go try to change things by voting. That's about all I have left to say about that topic, other than, "Go Vote, dammit!" On a side note, I'm in trial out of county this week, so I won't have time to do any type of post-election recap on the blog tomorrow night. Y'all feel free to use the comments as a sounding board on the tragedies and triumphs that I'm sure will have occurred by this time tomorrow. Don't say anything I wouldn't say . . .